Documents Interface Overall introduction to the Documents interface, and common views which can be switched in the Documents application. Navigating through Documents Ways to browse your documents in the Documents application, both in the Icons and List views. Document Viewer Introduction to the document types and how the Document Viewer enhances the readability and the collaboration. Open in Office Introduction to this feature, as well as compatibility and client requirements that you need to know. Working with basic actions Step-by-step instructions on how to do basic actions on your documents and folders. Organizing your content Instructions on various ways for you to arrange your documents efficiently. 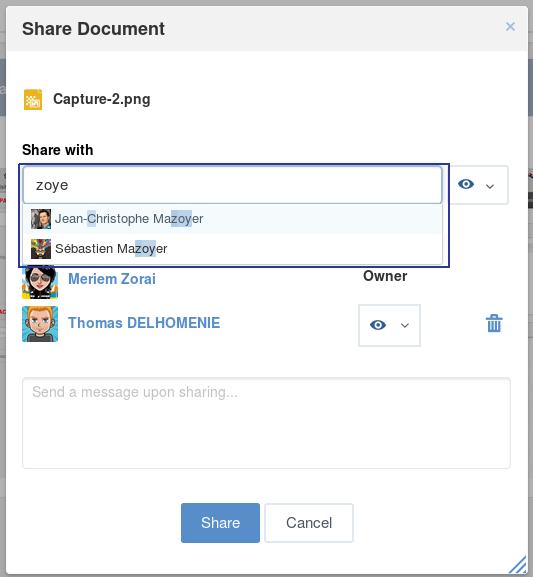 Sharing your documents Information about the Share and Auto-share features which are integrated into the Documents application. Extending your actions Detailed instructions on how to extend some useful actions which are not set by default in the Documents application. Store, share and work on the same content efficiently. Trace changes of content intuitively and instantly. Simplify the way to manage your content. 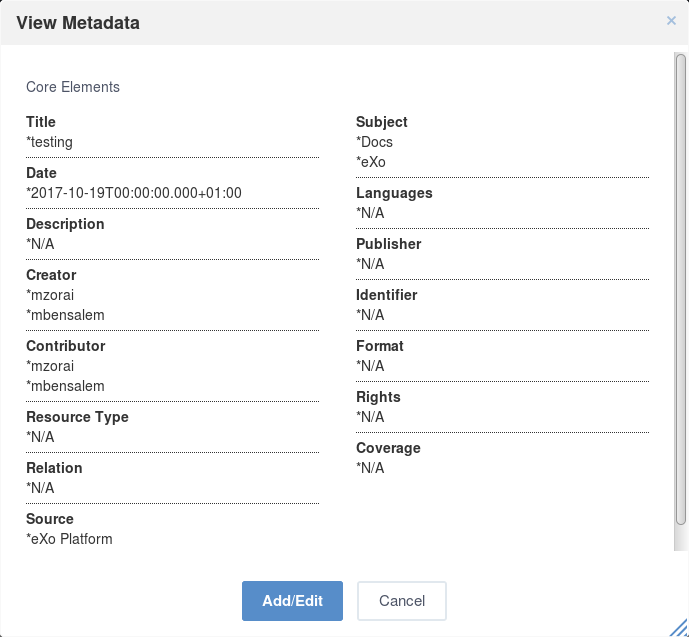 The Enterprise Content Management system delivered by eXo Platform not only satisfies basic demands (for example, uploading, previewing and sharing/editing), but also makes useful capabilities available (versioning, metadata, advanced searches, and more). These new management solutions featured in the Documents application are built on existing content management capabilities in a flexible and practical way. The “document” denotes a file, script, image or piece of information. The “folder” denotes a directory which contains a set of documents and even sub-folders. The “content” is used for denoting both document and folder. After logging into the Social Intranet homepage successfully, you simply click Documents on the left panel to be redirected to the Documents interface. As a normal user, you can switch between Icons and List views by clicking or respectively. If you are an administrator, you can see Documents in the Admin view. In the Icons view, you can do actions via the Right-click action or directly on the Action bar. In the List view, the Right-click action is disabled. Depending on your various purposes, you are free to switch between the Icons and List views just in one click. That is, if you want to see your content as images, it is recommended you use the Icons view. But in case you want to see more details directly in the view, the List view is an optimal choice. 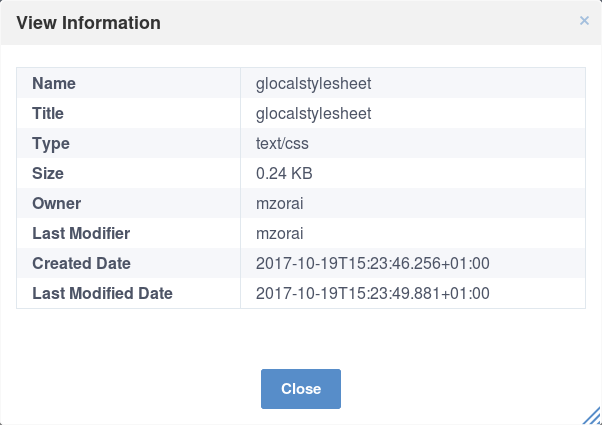 Seeing important details of your content, including name, created/updated dates, creator, file size, directly in the view. Other information (such as extension, version number) is also present here, if any. Showing/Hiding children of content without going inside it. Thus, you can have multiple folders opened in the view. Changing the current context for a specific content simply clicking its name. Doing basic actions on your content. In the Icons view, double-click the content to open it. In the List view, click to expand a specific folder that allows you to see its children without going into the folder. To hide its children, simple click to collapse this view. Enter the path of the relevant content directly into the address bar. You can come back to the previous content by clicking . Browse your content from the left sidebar in the Icons view. In the List and Admin views, the sidebar is disabled by default. To browse in this way, refer to Hide explorer panel in sidebar. Switch to another drive by clicking on the Action bar. A list of drives which are accessible to you will be shown. Depending on your role and permission, you will see various drives. See Drives for more details. The Documents application allows users to build custom content types and provides some built-in content types. It also provides a viewer for common file types so users can read Office documents, view images or play videos directly from the activity stream. Printable files: pdf, doc (and other Office files) or any other type of files JODConverter supports. See the full list of types at JODConverter, Administrator Guide. Images: png, jpg, jpeg, gif. ECMS content, either custom or built-in templates, such as a web content template. For these viewable types, when you click a document preview thumbnail in the Activity Stream or select the View Document menu from Documents in the left navigation pane, the Document Viewer opens. The viewer provides a large viewing area and some functions, such as Search, Download and Print. To exit the Viewer, hit Esc key or click X icon at the top right corner. You can always view pdf files, whereas Office documents require JODConverter to be installed on the server. If you cannot view an MS Word file, for example, contact your administrators. For these file types, the Document Viewer provides maximized reading estate and all the functions listed. Although you can simply scroll to go to another page, the Page Navigator provides many page selectors (e.g. previous, next, first and last page links, page number selector). You can also show/hide the Page Thumbnail pane by clicking the leftmost icon in the toolbar. Click it again to close it. Search: Click the Search icon to open the Search bar and click it again to exit. Download: Click the Donwload icon to download the file. Full screen mode: Click the Switch to Presentation Mode icon to read in full screen. Hit Esc key to exit this mode. Print: Click the Tools icon then select Print. Comment: You will see the Comment area on the right side when you open the viewer. If it is hidden, you can bring it back by clicking the rightmost arrow icon. Like: In the Comment area, click the Like icon to like the post. Click it again to unlike. For viewable media types, the available functions are Download, Comment and Like. If the document is ECMS Content, it is viewable. The following screenshot shows illustrated web content, which is one of the built-in templates. With the Open in Office feature, you are able to easily edit documents, spreadsheets and presentations in the native applications installed on your client, without keeping a local copy. In fact, this feature already existed before, but since PRODUCT 4.2, more operating systems and browsers will be supported. You will be able to open not only Office formats, but also virtually any file format as long as an application is associated with it in your client. Open in Word for file types: .docx, .doc, .docm, .dot, .dotm, .dotx. Open in Excel for file types: .xltx, .xltm, .xlt, .xlsx, .xlsm, .xlsb, .xls, .xll, .xlam, .xla. Open in Powerpoint for file types: .pptx, .pptm, .ppt, .ppsx, .ppsm, .pps, .ppam, .ppa, .potx, .potm, .pot. Open on Desktop for Non-MS Office files that are different from Word, Excel or Powerpoint files. The labels used for these buttons can be set by an administrator. See how-to in Administrator Guide. By default, in some views (including Admin, Icons and List view), these buttons will be displayed as an action on the Actions bar. These buttons can be configured in any views (Categories, Web) like any other actions by your administrator (Administration –> Content –>Content Administration –> Explorer –> View–> –> Action tab –> –> Remote Edit checkbox). These buttons will not be displayed in case multiple files are selected. 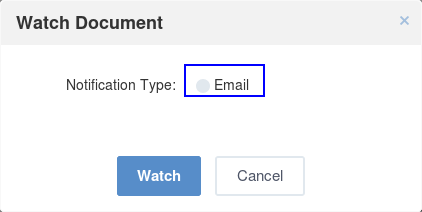 By clicking either of these buttons, you can open and edit that document in one native application that is registered on your client. A new version of the document will be automatically created when it is saved within the Office application. When one document is currently opened by one user, the Lock icon will appear next to that file: . If you still want to open this file, one message saying that you can open it in the Read-only format will appear. In case there is no application registered for one file type, one message appears, saying that you have no application registered to open that file. To make this feature work well, you need to learn about Compatibility as well as Client requirements. eXo Platform core has a basic compatibility for Microsoft environments. So, if you are using Windows (7, 8 or 10) with Microsoft Office 2016 installed, you can work with Word, Excel and Powerpoint files in many browsers: IE11, Firefox, Google Chrome and Edge. It is recommended to use the latest versions of Firefox and Chrome. Google chrome browser is incompatible for Ubuntu OS. For Chrome in Windows and MAC OS, you need to enable NPAPI, as said here. In client side, you need to pay attention to the following environment requirements before using this feature. For all OSs/browsers, it is recommended you install and make sure Java Applet enabled. This is required for opening Non-MS Office files. You can visit http://javatester.org/ to make sure Java Plugin already installed on your browser. Note 1. Allowing to open and edit MS Office file types. Configure WebDAV Redirector on the client. On Windows 7, click Start, type regedit in the Start Search box, and then press Enter. If you are in Windows 8, hold the Windows key (WINKEY) + F, highlight Apps in the Menu bar, type regedit in the Search box, and press Enter. Locate to the following: HKEY_LOCAL_MACHINE\SYSTEM\CurrentControlSet\Services\WebClient\Parameters. In the Value data box, type 2, and click OK.
Update the Registry on the client. Locate to the following: HKEY_CURRENT_USER\Software\Microsoft\Office\14.0\Common\Internet (for MS Office 2010) or HKEY_CURRENT_USER\Software\Microsoft\Office\15.0\Common\Internet (for MS Office 2013). On the Edit menu, create BasicAuthLevel with the same value as in Configure WebDAV Redirector on the client. Exit Registry Editor, and restart your client. If you install both Microsoft Office and OpenOffice, you need to choose Microsoft Office as default application for office files. When you open/edit a Non-MS Office file, one NPE exception is thrown on eXo Platform server and even when the file is opened successfully, the client gets very slow. See here for understanding the problem. In case you cannot open Microsoft Office files, you should close or force closing Microsoft Office Application, then re-open it. In MAC OS 10.9, to edit a text file, it is recommended you use TextWrangler (not default TextEditor) to edit it. Uploading files from your local devices is a fast and efficient method to create and store your documents in Documents. You now can upload multiple files from your local devices by holding Ctrl (on Windows) or Command (on Mac) to select them at the same time. When you start your upload, you will see the Upload Status window at the bottom. In this window, the progress bar will appear next to the files which are being uploaded. Abort all uploads by clicking Abort all. See necessary information of upload by clicking . After your uploads are finished, you can click at the right top corner of the dropzone to close it. Cancel your progressing upload by clicking next to the progress bar. The upload size depends on the size limit that your administrator set up in the ‘Edit’ mode of Sites Explorer. If your file size exceeds the limit, the alert message will appear. 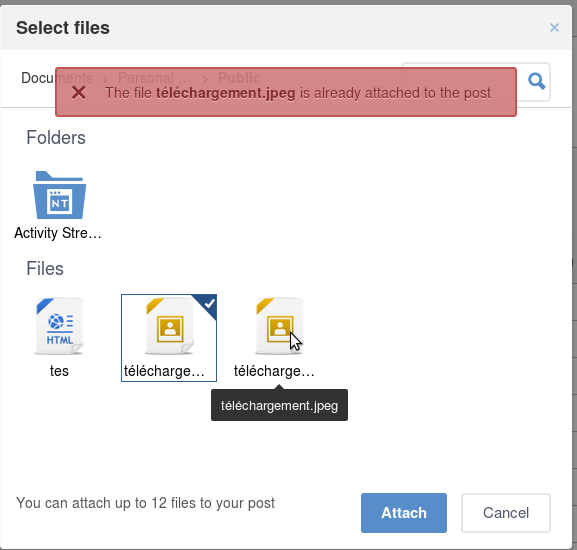 If the name of your uploaded file is the same as that of an existing file in the same location into which you are going to upload, you will receive one warning in the dropzone that your file is already in use. Here you can decide to keep both (your uploaded file and the existing file), replace the existing file with your uploaded file or cancel your file upload. 1. 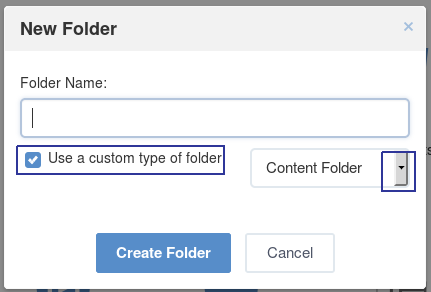 Define the folder where your files will be stored. Click Upload on the Action bar to open the File Upload window. Browse and select your desired document, then click Open to start uploading your selected files. Simply drag and drop files from your local device to your desired folder. Or, drag and drop files to the dropzone which appears when there are files ready to be dropped at the bottom. 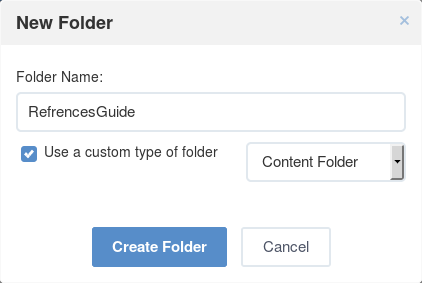 To make your content management neat and easy to find, you should create appropriate folders to store them. Go to the location that your want to create a folder. Select to open the New Folder form. By default, if you do not select the Use a custom type of folder checkbox, a Document Folder type will be created. Tick this checkbox, then select another folder type from the drop-down menu. Enter a folder name, then click Create Folder to finish. The name of a folder may be the same as that of the existing ones. In this case, an index will be added to your newly created folder that can be seen on the address bar. The list of available folder types which can be created in each drive is different depending on the drive configuration. Child folders will have the same folder type as that of their parent folders. Define the document, then select from the Right-click menu or on the Action bar. Your selected document is opened in another tab with the link containing the document path. 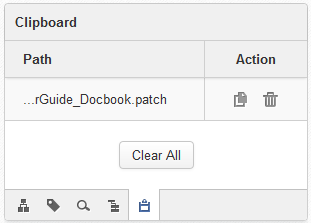 Simply double-click the document in the Icons view, or click the document title in the List view. Your document will be opened directly in the main panel with its path at the address bar. Here, you can also save your opened document as a PDF file or download it to your local device. 1. Select Edit Document Properties from the Action bar to open the File form. Change information for your document, except the Name field. You can edit the Categories field only by clicking . 3. Click Save to commit your changes, or Save & Close to save and close the form, or Close to cancel your changes. These functions are used to make a content copy (including its children and references) to other places. Select or from the Right-click menu or on the Action bar. Select the destination where the copied/cut content is stored, then select from the Right-click menu or on the Action bar. The Paste function is enabled only after the Copy/Cut action is selected. The copied/cut content (and its children) will be pasted into the new selected path. To do this way, you have to enable the Show Sidebar checkbox. Select the destination that you want to be the parent of the content which is copied/cut. Select on the Filter bar to open the Clipboard window. 4. Click in the Clipboard window to paste the copied/cut content into the selected destination. You can click to delete the specific content from Clipboard. You can also click the Clear All link to delete all from the list. You only can take the Copy action if you have this right on the source content. You only can take the Paste action if you have the right on the destination. If the destination has the same name with the copied content, after being pasted, an index will be added to the name of the pasted destination, for example Live and Live. You cannot copy a “content” folder into a “document” folder. After taking the Copy action, you can take the Paste action on the different destinations before taking another Copy action. You can only take the Delete action if you have the permission on that drive. You can delete multiple content at the same time by holding theCtrl (on Windows) or Command (on Mac) key and clicking the desired files and folders. If any folder is deleted, it means its child folders and references (if any) will be deleted accordingly. Select from the Right-click menu or on the Action bar. If the deleted content has a symlink, this will be also deleted. Once you have deleted the content, you will see a message at the top, indicating that your deletion is completed successfully. If you want to restore your deleted content immediately, click the Undo link. The deleted content is stored in the Trash drive. By going to this drive and selecting Restore From Trash, you can restore your deleted content. Currently, only administrators have the right to access the Trash drive. Deleting any content from the Trash drive will remove them permanently. The Vote feature is used to assign a rating to a document. In eXo Platform, you can vote for a document via the 5-star rating. The more stars you select, the higher rating you evaluate. 1. Open the document for which you want to vote, then select on the Action bar. The Vote Document form appears. 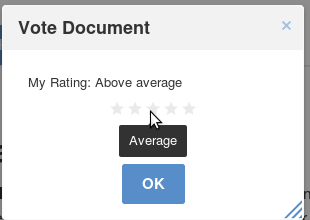 Rate the document by clicking the appropriate star level. Avg. Rating: The average value of all votes assigned to the document. Votes: The number of votes assigned to the document. 1. Open the document for which you want to tag, then select on the Action bar to open the Tag Manager form. To view the whole list of tags, you just need to click on from the sidebar. 1. Open the document for which you want to tag, then select on the Action bar. If you do not want to represent a content with an existing but boring icon, you can change this by adding your desired thumbnail to your content. Select content to which you want to add a thumbnail. Select on the Action bar to open the Add Thumbnail Image form. 3. Click Choose Thumbnail Image to select the image which will be used as the display icon for your selected content. A notification message will be sent to your email address which is set in your profile. However, if your account is suspended, the function will stop working. Once “Version” is activated for a document, this is called a “versioned” document. The saved state of a document is called “version”. Versions created for a document behave as parts of the versions history. The version on which you are currently working is called the “base” version. Versioning is an optional feature, so you need to activate this for either an independent file or a whole folder. Open the document you want to enable versioning. Click Activate to enable versioning for the document. You can enable versioning for an entire folder instead of doing it on every child document of the folder. For example, here are steps to enable versioning of the folder collaboration:/sites/test. 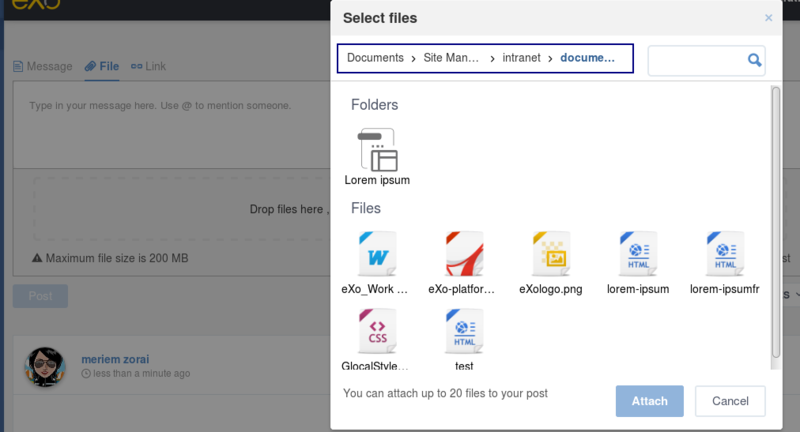 In Sites Explorer, open the drive Collaboration, then select the folder. Switch to Admin view, and click Actions on the Action bar. Create Action of Type: exo:autoVersioning. 4. Click the Search icon in the row Affected Node Types. Then check Select All Document Types, and click Save. Click Save, then Close to finish. Whenever you update a document in the folder, a version will be created. Versioning files is done automatically whenever a user overwrites a file. 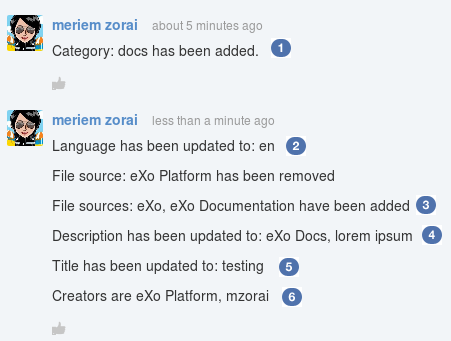 There are many ways in which eXo Platform will help you to create a new document version. 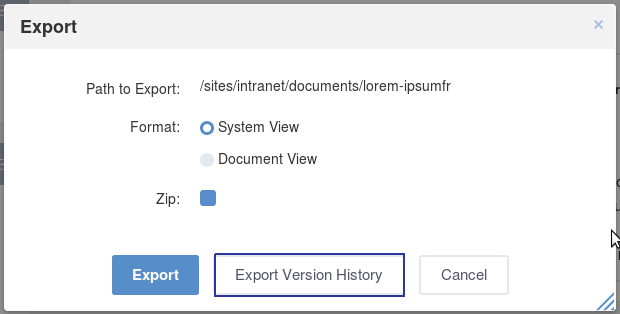 In the Documents application, there are two ways to create a version for a document. You can go to the folder that you want to create a new document version and try one of the following ways. Upload a file (or multiple files) to this folder by using the Upload button on the Action bar or dragging/dropping this file directly from your computer. 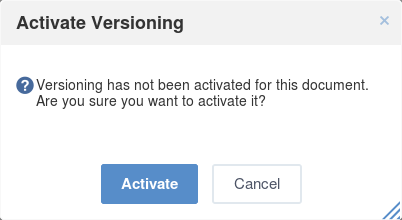 If the versioning is not enabled, no version is created. Keep both: no version of the existing document is created, but a new document is created with the same name (as a sibling document). Upload new version: a new version of the file is created with other information, such as title or description of the old document kept on the new version. Cancel: the upload is cancelled. Copy and paste a document (or multiple documents) to a folder which contains a document with the same name. In which, the options Keep Both, Save as new version and Cancel are exactly the same as the Keep Both, Upload a new version and Cancel options respectively in the first way. Besides, if you upload multiple files, ticking the checkbox “Remember my choice for all others versioned documents” will apply the selected option for the remaining versioned files. Ticking the checkbox “Remember my choice for all other versioned documents” will apply the selected option for the remaining not versioned files. There is also an another case in which you probably need to create a document version. Click in CKEditor of web content or illustrated web content file template. 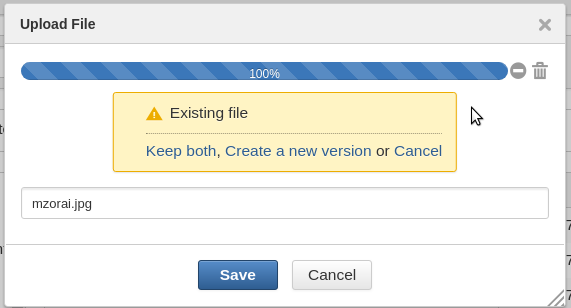 In which, the options Keep Both, Create a new version and Cancel are exactly the same as the Keep Both, Upload new version and Cancel options respectively in this case. 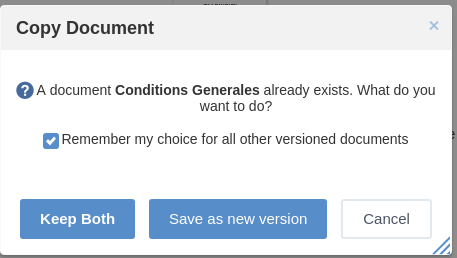 If the document is not versioned, the options will be the same. Open a versioned document that you want to create a new version in the Preview Mode. Click the Upload a new version button on the Action bar. 3. Select a file to upload. Notice that the uploaded file does not need to have the same name as the versioned document, but it should be the same file type. Once the file is selected, a new version with the same name as the current document is automatically created. One success message will be displayed. 1. Right-click the versioned document that you want to create a new version. Select the Create a new version button from the popup menu. This will automatically create a new version of the document based on the current version so that you can change the document properties on this version while its content is still kept. If this is a totally new document and versioning is enabled for the folder or the drive that contains the folder, its first version is created. If there is an existing not versioned document with the same name, the new document will replace the existing one. If there is an existing versioned document with the same name, a new version will be created. You can manage your versions by comparing with the current version, adding/removing labels, viewing/deleting versions or restoring to a specific version. All such management actions will be done in the Version History window. Check two versions among the versions list of the document/content. Click on Compare selected versions buttons. 3. 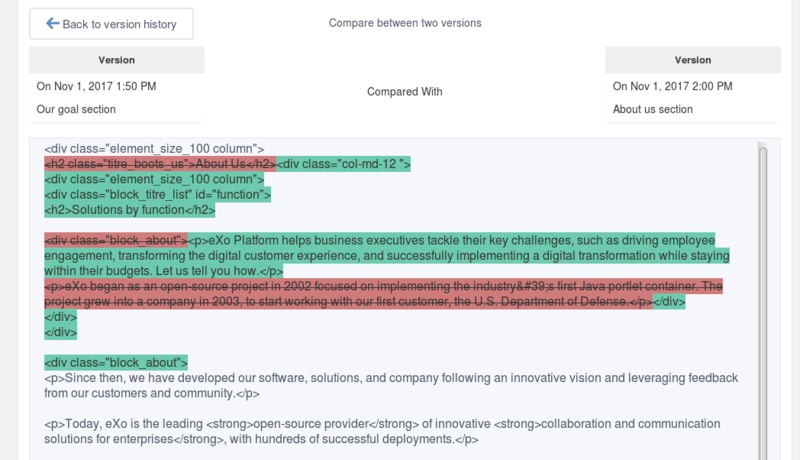 A page appears to highlight changes done between the two selected versions. If the update contains an addition, it is highlighted in green. If the update contains a deletion, it is highlighted in red. You can abondon the summary addition by clicking on . 1. Define the version that you want to restore as the base version by checking it among the version list. 2. Click from the column Action that is in the version’s line to make the selected version become the base one. Simply click to view the document at the selected version. Click corresponding to the version you want to delete. You cannot delete the base version. This function is used to comment on a document. Open the document to which you want to add your comment. Click on the Action bar to open the Comment form. Add your comment, then click Save to commit. The comments are shown at the bottom of the document. Click the Show comments link to view comments. Edit your comment by clicking or delete it by clicking . You can mention people in your comment by first typing “@” symbol then selecting the person name you want to mention. See Mentioning someone for more details. Document comments are displayed exactly like in the activity stream. 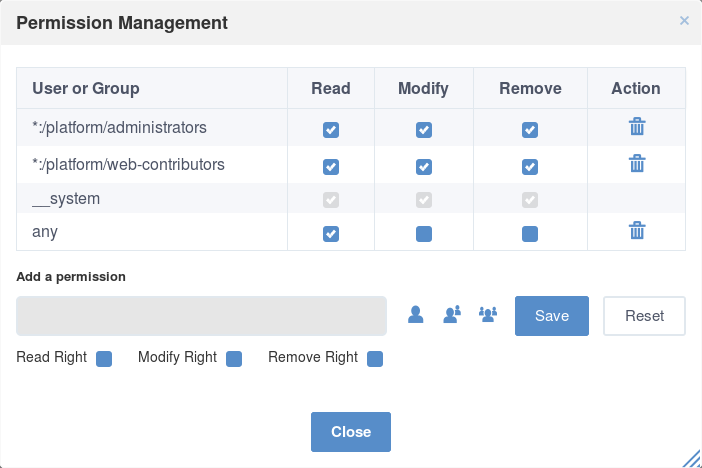 This function allows you to manage permissions on content. Select content, then click to open the Permission Management form. 1. Select a user or a membership or everyone whom you want to assign permissions by clicking or or respectively. Select right(s) you want to grants by ticking the corresponding checkboxes. When you select Modify Right or Remove Right only, the Read Right will be ticked automatically. granted to all users of the group, regardless of their membership role. Click Save to accept your changes. The new permissions will appear in the permissions table above. Editing permissions allows you to add more or remove a specific right granted to a user or membership. Define the permission of a user or membership in the permissions table. 2. Tick/Untick the checkboxes corresponding to the rights you want to grant or remove respectively. Click Save to accept your changed rights. Select the permission of a user/membership in the permissions table. Click , then select OK in the confirmation message. You cannot delete your own permissions. eXo Plarform supports you to view all information of a document, such as name, title, type, owner, created and modified dates. To view information, simply select from the Right-click menu or on the Action bar. The View Information form appears as below. This function allows you to view metadata attached to the uploaded file (nt:file). Click on the Action bar to open the View Metadata form. 1. 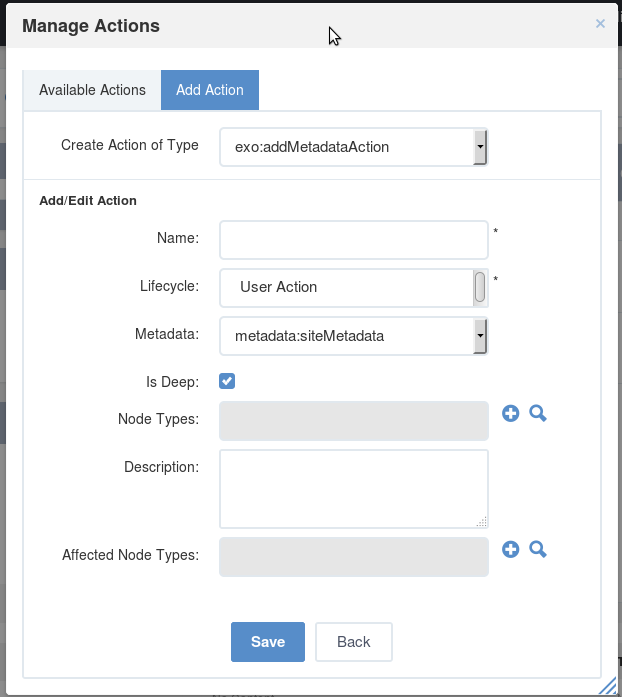 Click Add/Edit at the bottom of the View Metadata form to add or edit metadata to open the Add/Edit Properties form. 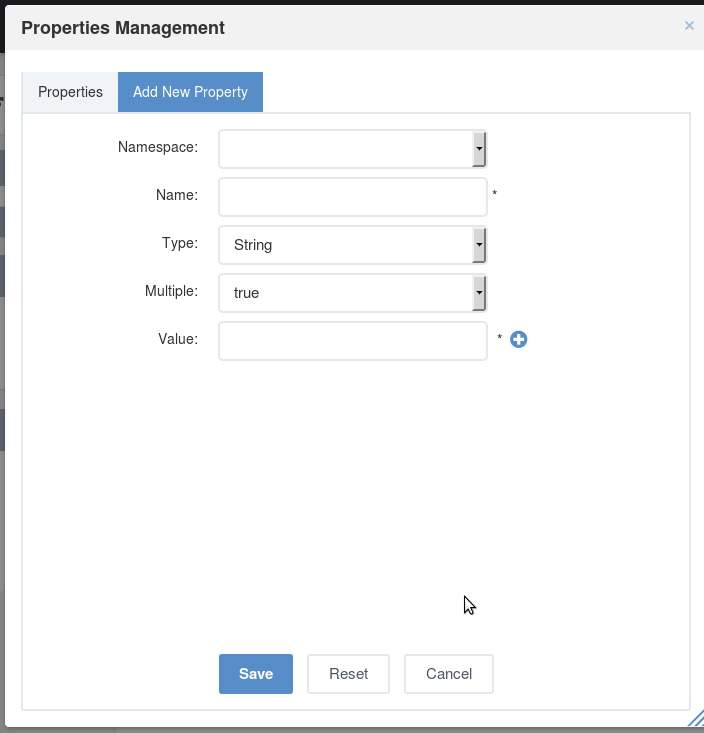 Complete the desired fields in the Add/Edit Properties form. Click to add further metadata for each field. Click to remove corresponding values. This function is used to change the content name. Give the new name in the input field. Click Rename to accept your changes. The title of your content is changed into Renaming… while being in process. The Copy URL To Clipboard feature enables you to copy the WebDAV URL of content. You then can view it using the WebDAV client as stated in WebDAV. 1. Select the content you want to copy its URL, then click from the Right-click menu or on the Action bar. Paste the URL on another tab. You can view the content you copied its URL or download it to your local device. You can also view other folders by clicking … above the current folder to go up its root. This function is to avoid changes on a specific content and actions by others, during a specific period. Select the content, then click from the Right-click menu or on the Action bar. The selected content will be locked. Only users with appropriate rights can lock the content. After being locked, other users can only view the content. user who locks the content signs out, the content will be unlocked. functions outlined above); however, the original content cannot be removed or altered. If no action is taken on the locked content within 30 minutes, the lock will be automatically removed. Select the content which has been locked, then click from the Right-click menu or on the Action bar. The content will then be unlocked and other users can take actions on it. 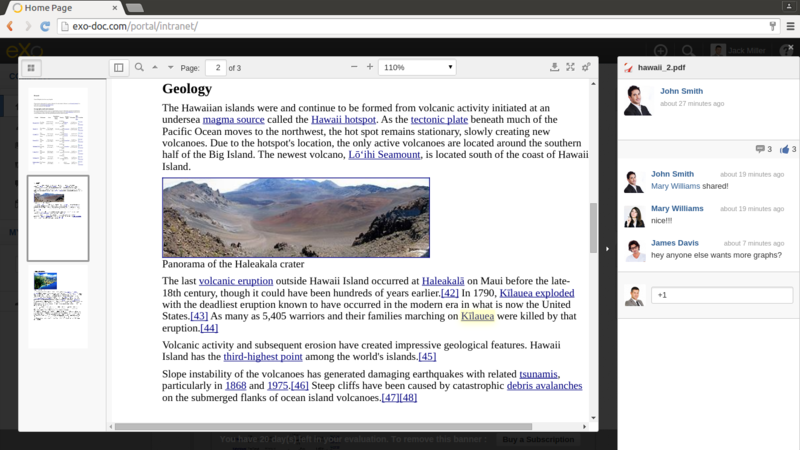 WebDAV enables users to access, then read/write the content over the web browser. Thanks to its benefits of easy, quick and flexible manipulations and time-saving, WebDAV is often used to view the content. Select the content you want to view WebDAV. Click from the Right-click menu or on the Action bar. For folder: The list of children under the current folder will be displayed in WebDAV. For nt:file: The content of the document will be shown. In addition to web browser, you can access the content through another WebDAV clients. See WebDAV for more details. In the List view, your content can be found easily and quickly by using the Sort option. You can arrange your content by sorting them to Name, Date and Size in ascending or descending order. Instead of scrolling all your content in the long list, you can use Paginator to organize them into separate pages. The Paginator value is set to “20” by default. This means the Paginator button will be visible if the content number exceeds 20. To change the Paginator value, simply click and pick another one from the Nodes Per Page drop-down list. By using the Add to favorite feature, you can easily find your preferred documents easily in the Favorites folder. This is an efficient way to manage your documents. Define the document you want to add as favorite. 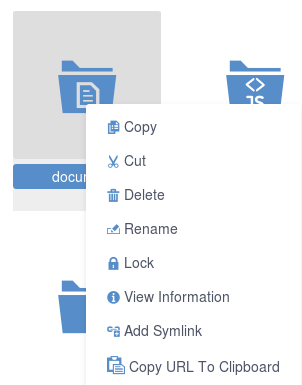 A symlink of your favorite document will be created in the Favorites folder. Define the document which has been added to the Favorites folder. You can go directly to the Favorites folder, then remove the document from it. A symlink is a special type of document that points to one file or folder. To add a symlink, simply select from the Right-click menu or on the Action bar. The symlink will be added to the selected document immediately that is marked with . When you perform an action on a symlink, the action is also performed on the content to which the symlink points. When you delete a symlink, you delete the link’s content, not the content to which the symlink points. This function is used to set up your browsing preferences. Click on the right side of the Action bar. Sort by Sorts content in the list by Alphabetic, Type, Created Date, or Modified Date that is associated with the Ascending or Descending order. Show Sidebar Displays/Hides the sidebar. Enable Drag & Drop Enables/Disables the “drag and drop” action. Nodes Per Page Defines the number of content displayed per page. Show Non-document Nodes Displays/Hides items that are non–document. 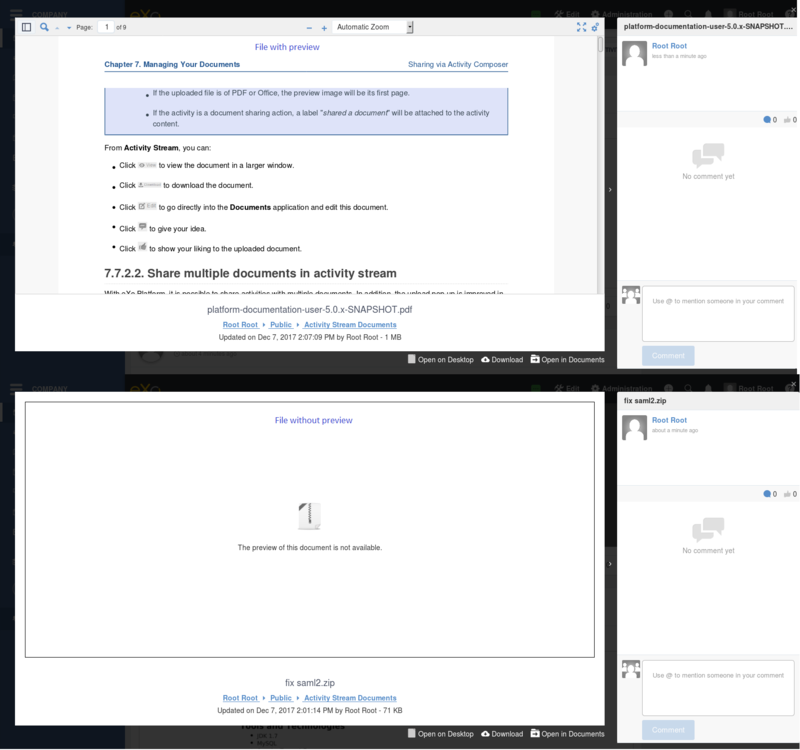 Show Referenced Documents Displays/Hides referenced documents. Show Hidden Nodes Displays/Hides hidden documents. Enable DMS Structure Displays/Hides documents in the tree structure. Query Type The query type. Or, click Close to quit without submitting changes. You can organize your content effectively based on the existing filters on the sidebar in the main view. Thus, to filter your content, you need to enable the sidebar first. Owned by me to show your own ones. Favorites to show ones added to favorites. Hidden to show hidden ones. Filter By Type to show ones by various types, including: Content, Document, Image, Music and Video. You can combine more than one filter at one time to find out your desired content. 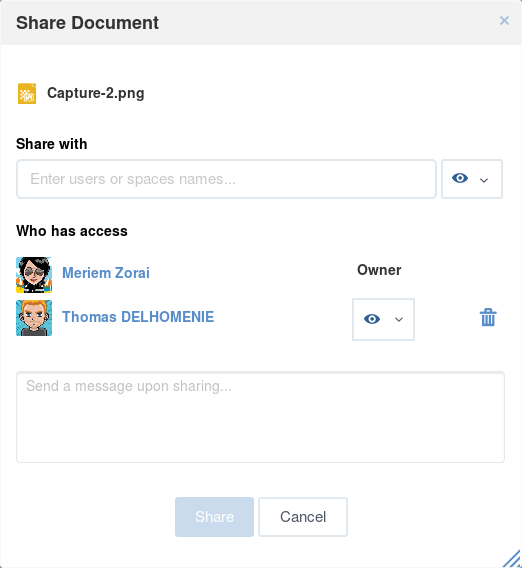 Instructions on how to share your documents in your spaces using the Share feature of the Documents application. 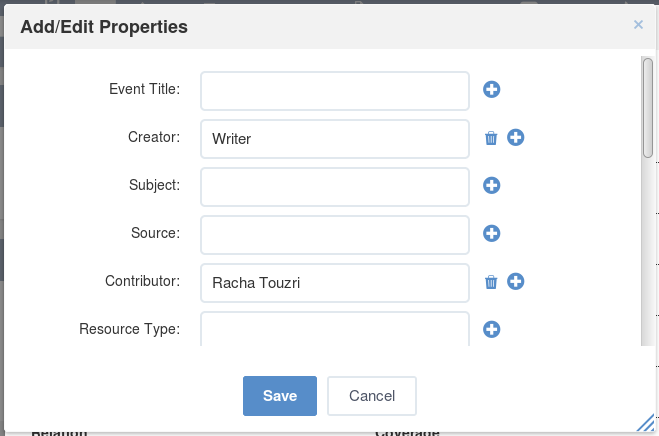 Explanations on the automatic creation of a new activity on the Activity Stream when you finish uploading or sharing a file and information related to the update of the activity when you do some changes on the document. Click Documents on the left panel, you will be redirected to the Documents interface. Only one file can be shared at a time, so you will not see the Share button if you choose more than one file simultaneously. Click on the Share button, you will see a sharing dialog. 4. Type the first letter from the username/space to which you wish to share the document. A drop-down list with the names of users and spaces having that letter appears. Select the users/spaces to which you want to share the document. After selecting at least one user, the share button becomes enabled even without precising a permission. Can View : space members can only read the file. Can Edit : space members can read and modify the file. By default, the Can View permission is applied. If you do not have the Can Edit permission on this document, only the Can View right is available for setting permissions. The who has access section of the sharing dialog is alimented after the share action i.e. after clicking on Share button. 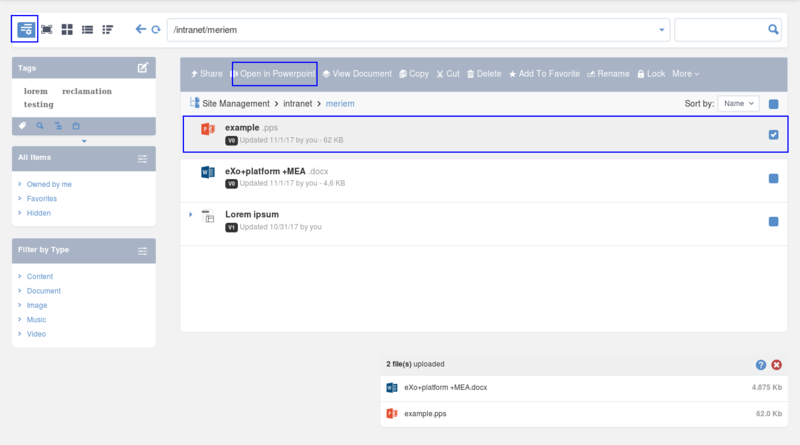 The Who has access section contains the list of spaces/users with whom the document is shared and the persmission they have on it. The first entry of the list is the owner of the document, it cannot be removed. After the document’s owner clicks on Share button, new entries (users/spaces with the corresponding permission) will be added in the bottom of the Who has access list. Other entries are displayed in a scrollable area. Each entry contains : share target (user or space), permission (can edit or can view) and a delete icon. If the user enters a username that is not valid, the share button becomes enabled but when clicking on it a warning appears indicating that the username is not valid. Add some comments or descriptions about the shared document into the succeeding text box. This step is not mandatory. Click Share to finish sharing this document with the selected users/ spaces or Cancel to skip sharing. After a document is shared successfully, a symlink will be created in the destination spaces and put into a folder named Shared in the Documents folder (if the folder does not exist in these spaces, it will be automatically generated while sharing a file). Therefore, the document could be shared again by any member of these spaces. This sharing activity will be automatically updated on the Activity Stream. Refer to Sharing via Activity Composer for more details. If the original file is deleted, all its associated symlinks in all spaces will be removed. 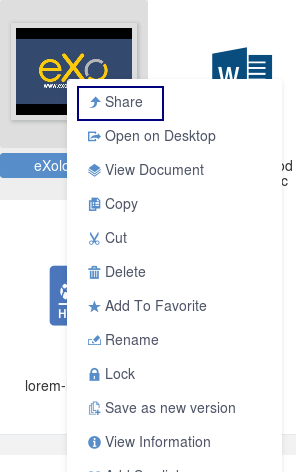 eXo Platform continuously improves the pleasure and value in engaging with the users’ community by integrating the Auto-share feature into the Documents application. This integration fundamentally complies with privacy rules; that is what made in folders (except Public) of the Personal Documents drive will not be shared on Activity Stream. Therefore, Auto-share is only featured in spaces, and you are required to be owner or member of the space to see activities updated in the space’s Activity Stream. At the same time, these activities are also updated in the Social Intranet homepage. 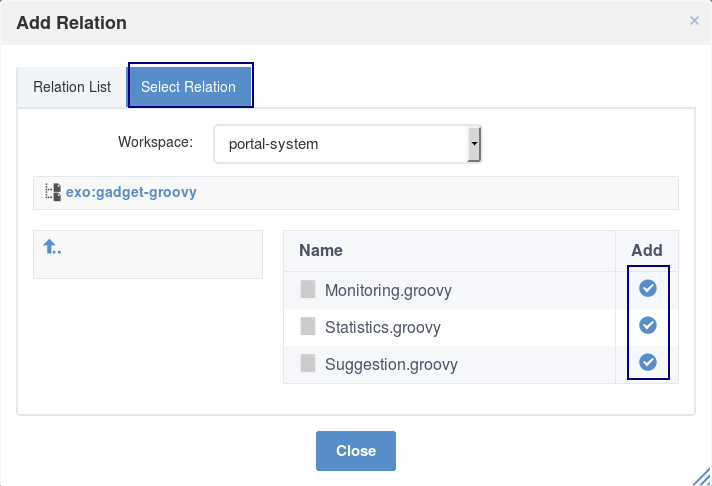 Assume that you have created a space or are a member of a space named PRODUCT TEAM, then start doing certain actions in the Documents application of this space. 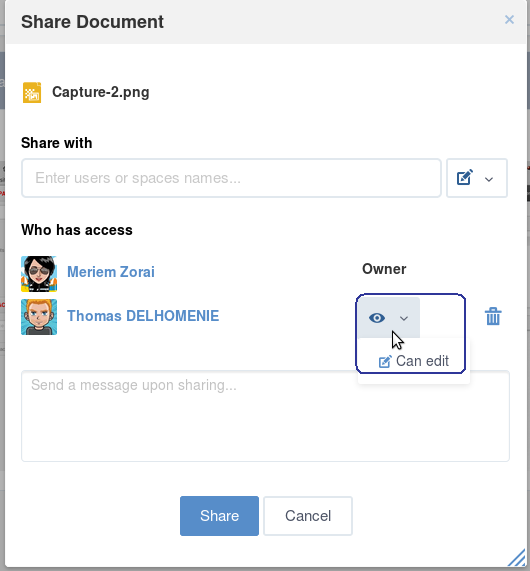 Many of the actions (for example, uploading, editing or sharing a document) will be automatically shared on Activity Stream although you do not take direct actions to share them. As a result, another members can see what you are doing on your content via Activity Stream. 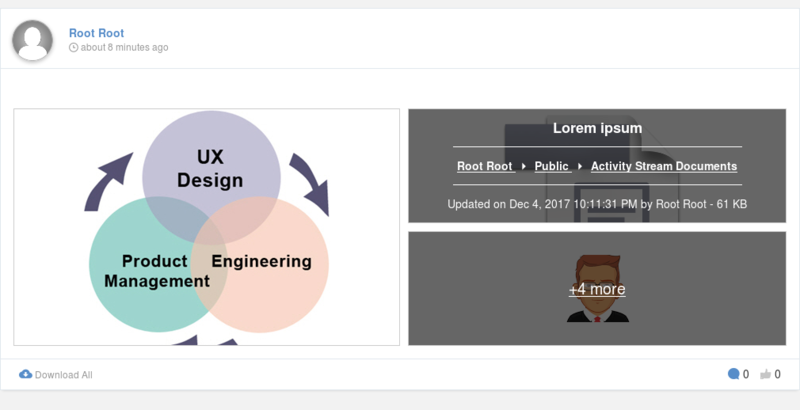 Once you have finished uploading or sharing a file to the Documents application of the PRODUCT TEAM space, one new activity will be created on Activity Stream. The file name or title , if any. The file description , if any. The file version and size , if any. If the uploaded file is an image, the preview image will be displayed on the activity content as a filetype icon. If the uploaded file is of PDF or Office, the preview image will be its first page. If the activity is a document sharing action, a label “shared a document” will be attached to the activity content. Click to view the document in a larger window. Click to go directly into the Documents application and edit this document. With eXo Platform, it is possible to share activities with multiple documents. In addition, the upload pop up is improved in order to make easier and ergonomic the upload process. 1. In the microblog, select File tab. 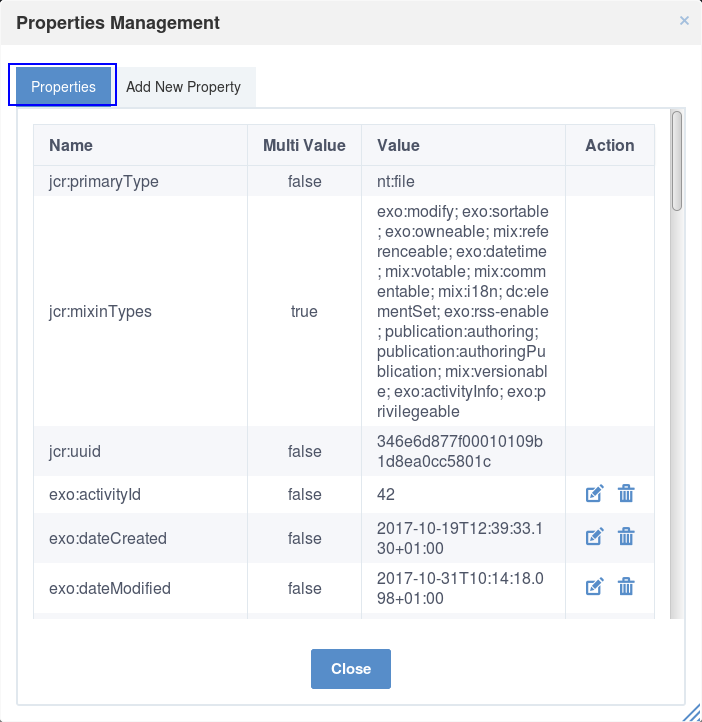 The activity composer will suggest you either to drop files from your computer using the mouse, to upload manually from desktop or mobile or to select from existing uploads in eXo Platform. Drag and Drop: Allows you to drag and drop files from your hard disc. When droping the file, the area dedicated to the files upload is greyed. upload manually: Allows you to select documents from your hard disc. Cliking on upload manually opens a window showing a drive from your hard disk (it opens files drive for mobile devices) and allows you to select one or many files. 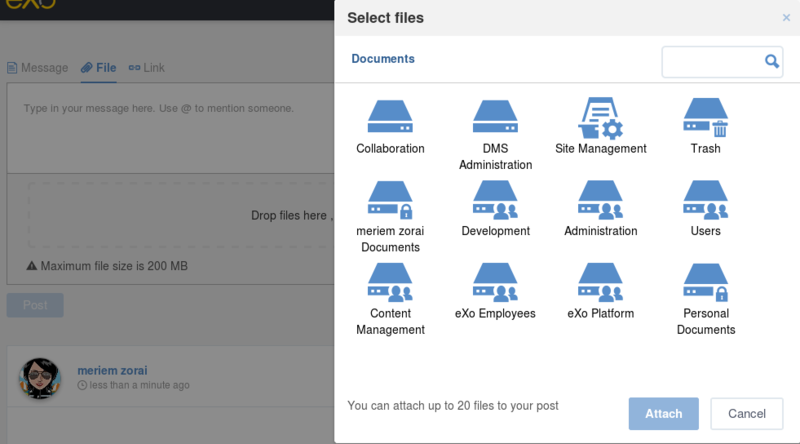 select from existing uploads: Allows you to select documents from your eXo Platform drives. You can select documents from Personal Documents drive, it is opened by default when clicking on select from existing uploads, or you can change to any drive you want. If the activity is in a space, the select from existing uploads action will open by default the space’s drive. It is also possible to change the drive. When you choose to upload manually or drag and drop files to the activity composer, these files will be added to the the folder /Public/Activity Stream Documents under the Personal Documents drive. If the activity is posted in a space’s activity stream, the files will be added to the folder /Activity Stream Documents under the space’s drive. 2. 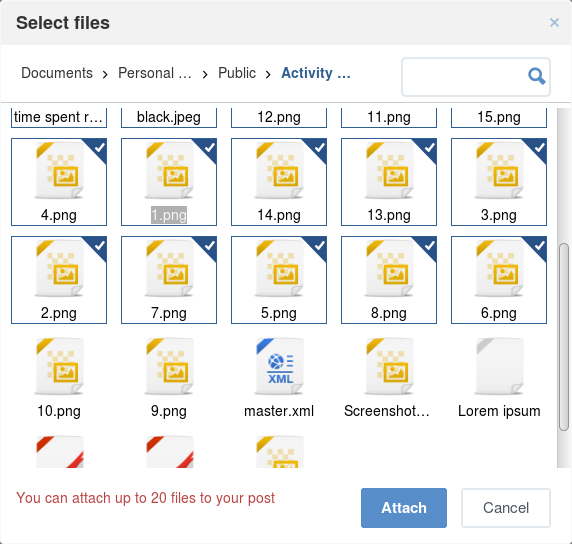 Choose the manner with which you will upload your files then select one or more files. An information box appears under the activity composer, it indicates information about the file upload progress and displays the file size. By default, it is allowed to attach up to 20 files per activity and each file’s size should not exceed 200 MB. These parameters are configurable in exo.properties file. More details here. You can cancel the upload of a file by clicking on or remove a fully uploaded file by clicking on . 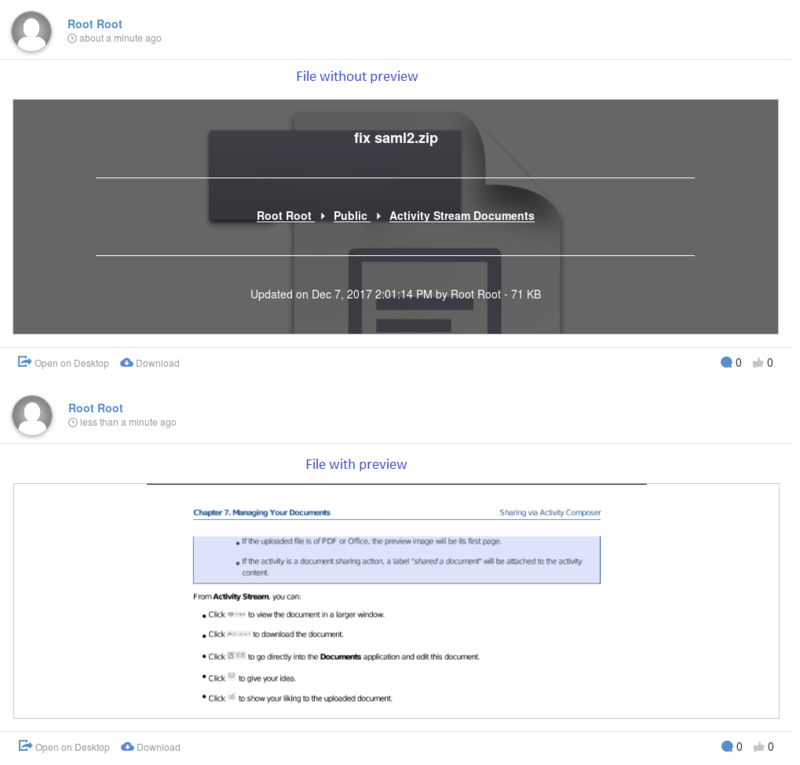 Click on Post to publish documents in the activity stream. When a user posts an activity in an another user’s profile, this user receives an email notification. 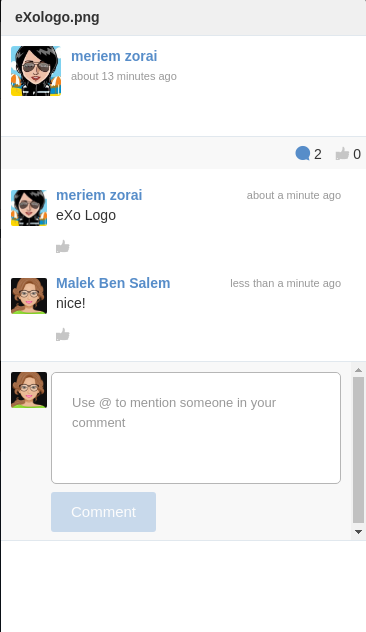 When a user posts an activity in a space, all the space members will receive an email notification. This email notification will contain all the shared files on a list with the file icon type, the file name and the file size. Clicking on a file name in the email notifications opens it in the Documents application. While published, an activity appears displaying the attached files ordred by selection order on the files list. Up to three files are previewed in the activity and a link containing the number of the other files. Clicking on it opens the following file from the list of uploaded files. When the user uploads only one file, the file’s container will take 100% of the file activity area. When two files are displyed in the activity, the file’s container splitting will be 50% for File1 and 50% for File2. When three files are added in an activity post, the file’s container splitting will be 50% for File1, 25% for File2 and 25% for File3. When the user displays more than three files, the file’s container splitting will be 50% for File 1, 25% for File2 and 25% to display (+X-2 more) link where X is the total number of files added. If the file uploaded has a preview (such as pdf, images, docx…), a part of it is displayed. If the file has not a preview (such as html, zip, war..), a thumbnail of its extension is dispalyed and a breadcrumb containing infomation about it. The file’s version (if it is different from the initial version). The file location as a breadcrumb (each element is clickable). The last update timestamp (including the creation date). The last user who made the latest update. Clicking on the filename of the breadcrumb opens the file in Documents application. Clicking on the file’s version opens the version history of the file. Clicking on a segment of the file’s location opens the corresponding drive/folder. Clicking on other details (update timestamp, User or size) opens the file’s preview in activity stream. 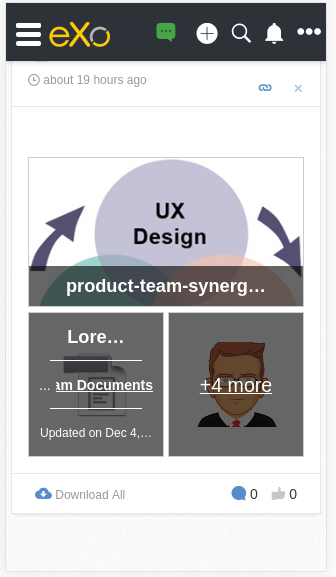 For mobile devices, the breadcrumb also appears for shared files. When any of the breadcrumb’s details exceeds the screen size, it is either preceeded or followed by an ellipsis. The breadcrumb behaves same as for web, its segments are clickable and it redirects to the correcsponding location as described above. A Download all button appears under the activity allowing to download all the files of the activity. It will generate a zip file named Activity_ID_Date. Date can be in Frensh format if the user is using the Frensh language and in English format if the user is using English or any other language except Frensh. You can navigate through the list of files by clicking on previous and next buttons. For mobile devices, you should scroll the screen left for next and right for previous. You can also close the file preview by clicking on close button. Clicking on a file opens it to be previewed similar as Document viewer. The breadcrumb appears also in the file’s preview but only the file’s location is clickable. When an activity contains some files with permissions (i.e a UserA is not allowed to view some or all documents in the activity), this/these file(s) will not be displayed in the activity stream of users who don’t have the permission to view. Deleting all files of an activity leads to the whole activity deletion and deleting one or more files from the activity eliminates these files from the display. If you attach more than the allowed number of files, a warning appears indicating that you can attach only 20 files. When selecting more than 20 files form existing uploads, a warning appears in the drive indicating that only 20 files are allowed to be attached. If you attach a file or many files exceeding 200MB, a warning appears to remember you the maximum size allowed. When trying to attach the same file twice, a warning appears to indicate you that the file is already attached. If you have, in the same drive, two files having the same name and you try to attach both of them, a warning appears indicating that the file is already attached. Once you have made the following changes in the Edit form, new comments will be auto-generated on the document activity. If you remove the document content, there will be no comment on the document activity. However, in case your document is of image, PDF, Office Document, the preview image will be disappeared from Activity Stream. If you upload a new content for this document, the activity content will be updated with a new comment. Once you have renamed a document, the new name will be updated on the document activity with a new comment informing about that. Checking in a document does not result in any new comment on the document activity. However, a version number will be updated on the document activity. 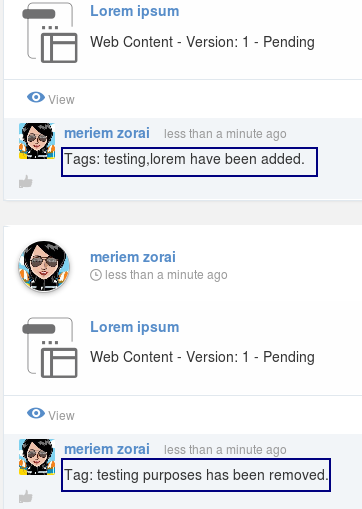 Once you have added or removed a tag from the document, there will be a new comment on the activity for such changes. Once you have commented on a document, there will a new comment on the document activity for such change. However, there will be no comment or no update on the document activity if you edit or remove the comment from the document. When you move a document to another folder, there will be a new comment on the document activity for such change. If you delete any document from the Documents application, all activities related to this document on Activity Stream will be deleted without any comment or notification. 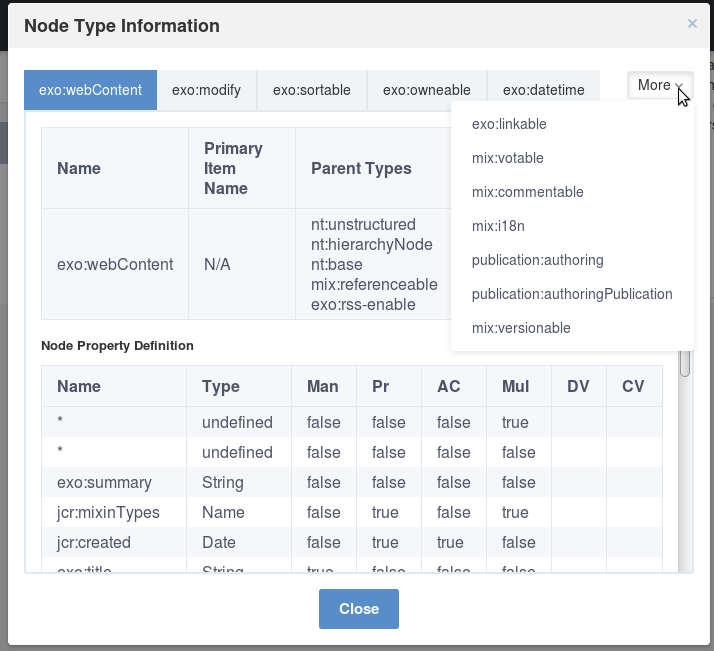 In addition to basic actions stated above, eXo Platform provides a list of additional features for managing your content. 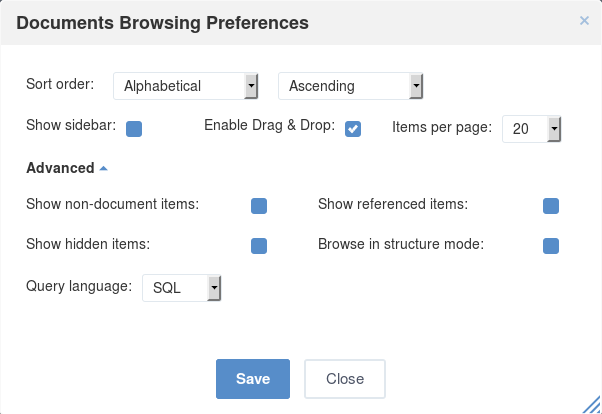 Some of extended features are set in the Admin view by default, or your administrator can enable them for any specific views. 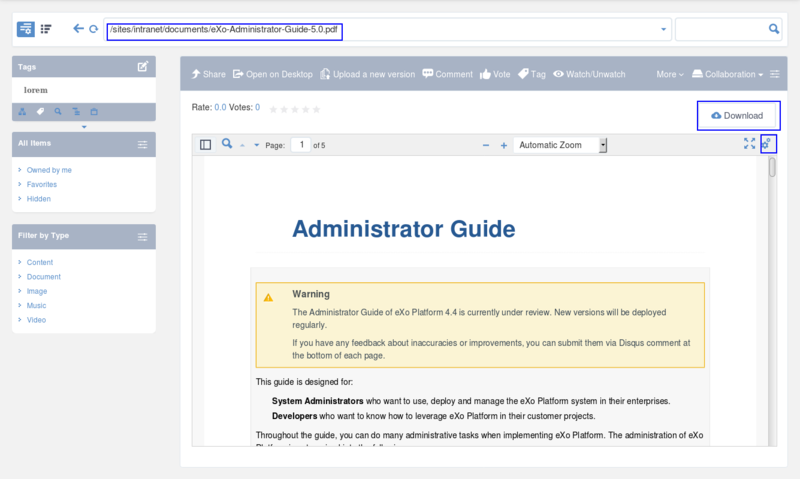 This part is mostly for administrators who have right to access the Content Administration page where extended actions can be activated. Besides, administrators can add more actions to any views. The followings are recommended features you may discover. In this section, assume that additional actions have been set in the List view by your administrator. Therefore, you will see them in the Action bar. 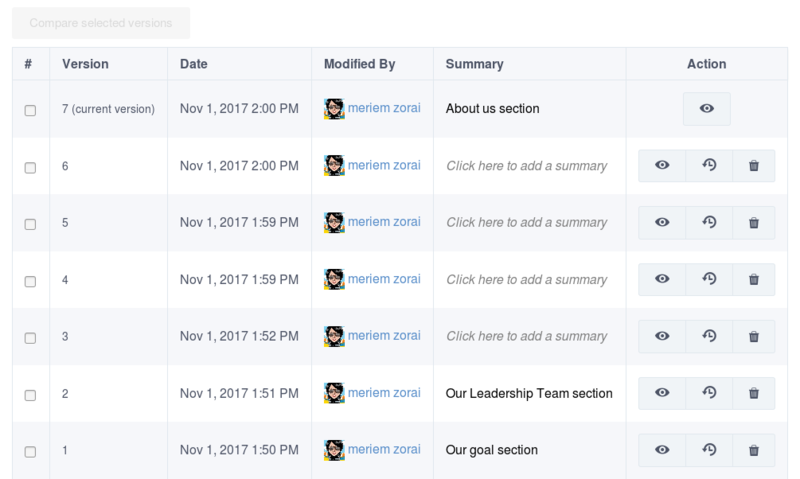 To manage actions, you first need to select the content, then click on the Action bar to open the Manage Actions form. Select the Add Action tab. 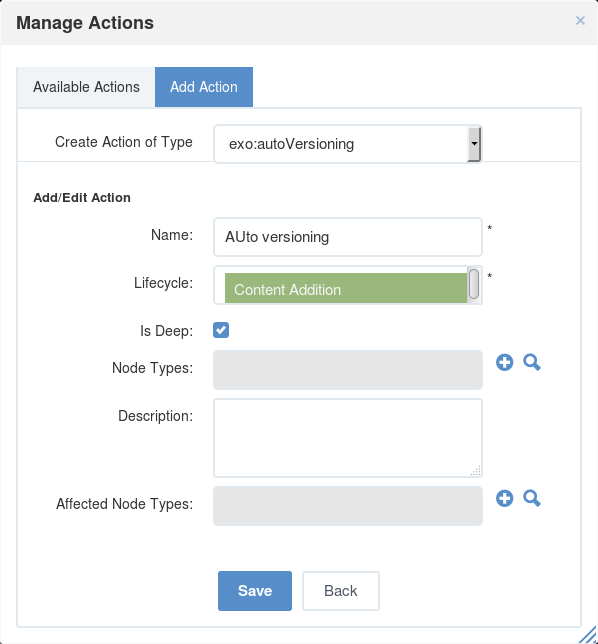 exo:autoVersioning Adds a version automatically. 3. Complete all the fields in the Add/Edit Action form. The Name and Lifecycle fields are required. Name Name of the action. This name is internal to the JCR explorer. ‘User Action’: The action is executed when you right-click the folder and then select the action. ‘Content Addition’: The action will be executed on a new document, but not on a subfolder when the document or the subfolder is created in the folder to which an action has been added. It is also applied to a new document in the subfolder of the folder. ‘Property Addition’: The action will be executed on a document when a property is added to the document. ‘Property Removal’: The action will be executed on a document when a property is removed from the document. ‘Property Modification’: The action will be executed on a document when a property of the document is modified. Click Save to commit the action. All actions of the content are listed in the Available Actions tab. Once an action is added to the content, it is auto-added to any children of the selected content. If an action is added with the lifecycle named ‘User Action’, it will be applied to the current content. If an action is added with other lifecycles, it will be applied to the child content. Not all actions are listed in a Right-click menu of the content. Some actions can be performed immediately when that action is added. Select the Available Actions tab. Click that corresponds to the action you want to view. The details will be displayed in the Action Info tab. Click that corresponds to the action you want to modify. Edit properties in the Action Form. 2. Click corresponding to the action you want to delete, then click OK in the confirmation message. This function logs property changes in documents. 1. Select the document, then click on the Action bar. The Activate Auditing message appears. 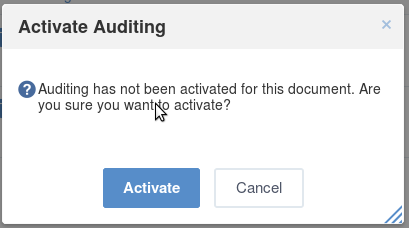 Click Activate to enable auditing on the selected document. Select the document which has enabled auditing, then click to view the audit information of the selected document. If the document has no audit information, the form will appear as below. If any, the Auditing Information list appears. This function allows users to review all the properties and values of a document. It can also be used to add values to a document. Select the document you want to review or add values to. 2. Click on the Action bar (or from the More drop-down menu on the Action bar). This tab displays all properties and values for the selected document. This tab contains fields to add new properties to the selected document. 1. Select the Add New Property tab to add new properties to the selected document. Select the property type from the Add new Property drop-down menu. Enter a value for the property in the Value field. Click Save to accept your new values, or Reset to clear added values. After you have made changes on a new property, you will be returned to the Properties tab. The newly added values will be displayed. In this form, you can edit a property by clicking , or delete it by clicking . You can use this function to create relations between documents. 1. Select the document to which you want to add a relation, then click on the Action bar. The Add Relation form appears. Select the Select Relation tab to see a list of other documents. 3. Click that corresponds to the documents related to the document selected in the Step 1. Documents linked to the original via a relation will be listed in the Relation List tab. Relations can only be added to document types. A document cannot have a relation to itself. 1. Select the document that has links to related documents, then click on the Action bar. 2. Select the Relation List tab to view relations of the selected document. Click corresponding to the relation you want to remove. The related document will be removed from the list. You need to enable the sidebar first. Select a document that has links to related documents. Click on the Filter bar. All documents related to the selected document will be displayed in the Relations list in the left panel. Click the name of the related document to view the linked document. Content can be exported into either .xml or .zip file types. Select the content that you want to export. Click on the Action bar to show the Export form. Path to Export The path of content being exported. This field will be pre-populated. The format of the original content. Each content and its property are included in a different tag. Each content is a tag and its properties are considered to be elements of that tag. Zip If this field is checked, the content will be exported as a .zip file. Click Export and select a location to save the exported file. The Export form can contain Export Version History if the exported content or any of its children is versioned. This action exports all of the content’s version history. Content which is in the .xml file format can be imported into the JCR Explorer system. Select the location where you want to import the new content. Click on the Action bar to open the Import form. 3. Select the file in the Upload File field and navigate to the file you want to import. New UUID will be generated and assigned to the imported node. There is no impact to the existing one. The already existing node (and its subtree) is removed from wherever it may be in the workspace before the incoming node is added. The already existing node is replaced by the incoming node in the same path as the existing node. This behavior may result in the incoming subtree being disaggregated to different locations in the workspace. The node is not imported. No impact to the existing one. Select the file for the Version History field. Click Import to import the file’s selected version. This function allows you to view documents in a tree structure. Click on the Action bar (or from the More drop-down menu). Select a document which is showing the content structure. Content can be hidden or shown easily. Select the content you want to hide. Click on the Action bar to hide the document. A confirmation message, which notifies that the document has been hidden, will appear. To show a hidden content, simply click again. This function allows you to view the detailed information of a document. Select a document that you want to view its detailed information. 3. Click the tabs at the top of the form to view categorized information.